I was talking to my friend last week about real food and clean eating, it can be confusing but they are very similar from what I gather. Organic Authority explains how these two trendy diets are similar and different here. After looking into clean eating and real food, I’ve realized that we kind of fall into the real food category. We don’t eat process food, food from a box, unless it’s less than five ingredients, we don’t eat fast food (at least I don’t) nor do we eat deep fried foods. There are other things like refined grains, white rice or white flour products that you’re not allowed to eat and in that I would say my family DOES enjoy those things. But lately I’ve eliminated a lot of those items from my diet. My children and husband have not but they’ve definitely cut down on it since I’m the cook. 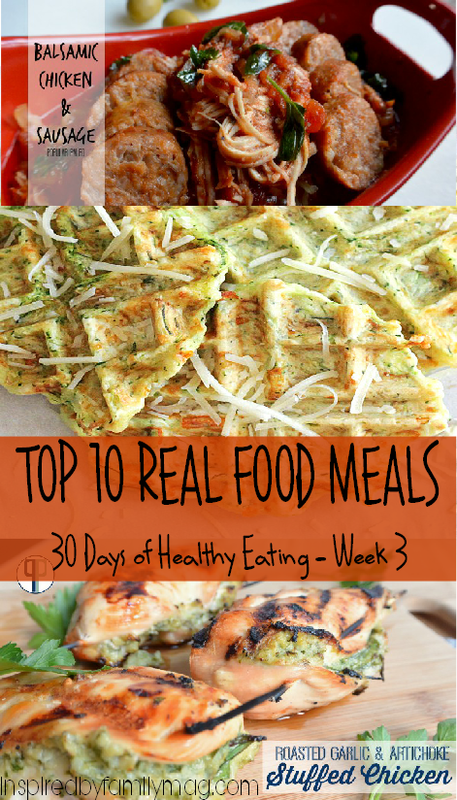 So if you’ve missed our 30 Days of Healthy Eating menu plan for the past two weeks here it is: Week 1 overview and Week 2. Feel free to look at week one’s list of recipes and pick and choose what works best for you for breakfast.